Below is effectively a development BLOG until I get the site sorted. 28.05.11 Long time since I did anything here! I will get round to updating the site eventually... Thanks to all who have emailed, keep 'em coming. We've been here in Australia for nine months now and loving it. Unfortunately there are very few tunnels! Only two here in South Australia and both are well and truly locked as they are used for wine storage. Adelaide is a beautiful city but there is not enough work here to keep me interested(!) so I am off to Melbourne. I'm going to get in touch with 'Dave' at the imaginatively named wine storage facilty and ask if I can have a look inside before I go. If not I'll at least visit the portals and put some pics on here. It will be a couple or three months before I get to Melbourne and I am not likely to get the site properly updated until I'm there. As for TunnelsOz.com, I've abandoned it as there are not enough tunnels here to make it worthwhile, any I do here will just have to be added to an Aussie section on this site. 15.08.10 It has always been my intention to go out with a bang when I emigrate to Australia and amongst the rarest, scariest, stupidest tunnels I could think of was Bolsover! Today we did it. (Well as far as we could anyway)... See a few pics in my Flickr set here. 09.08.10 I emailed a Nottingham shooting club a few weeks ago to see if I could contact the guys who shoot in Sneinton tunnel. I received an email a couple of weeks later from the secretary of the Association of Nottingham Shooting Clubs who very kindly invited me to take a look around. I told John who was very keen to come and I asked Phil and Fatna if they wanted to come along too as the area is their local patch. Anyway, we spent a good hour mooching around and taking a few snaps. I have uploaded a few to Flickr until I get round to getting the rest on here. 25.07.10 Just wanted to point you to Ben Salter's great and (hopefully) expanding set of Flickr pics of Rhondda (and other South Wales tunnels) dating from the early 1970's. It was a tradition for Ben and his friend to walk the tunnel each year until the unexpected happened in 1977/8 when they came across a shiny new solid breeze block wall near the air-shaft at the Blaengwynfi end and had to turn back! His best memory was tanking through the tunnel on the back of a motorbike! Get those slides scanned and get some more pics uploaded soon please Ben! 10.07.10 Another Phil Langham led day-trip to South Wales. We did: Cymmer, Maesteg, Torpantau, Morlais, Rhymney Tramroad Tunnel, Gelli Felin Up, Gelli Felin Down, Clydach Up, Clydach Down. So another 9 new ones for me - a good day, cheers Phil! John didn't come 'cos his fish was poorly! 02-05.07.10 Scotland - five days became four but I still managed to visit 51 tunnels and I walked 46. I need to concentrate for a couple of months on getting ready to emigrate to Aus so it will be a while before I get the Report up on here. If anyone wants any pics or info about the following tunnels then please, email me. Tunnels visited were (brackets mean I didn't get in! ): Whitrope, Ladhope, Torwoodlee, Bowshank, Eshiels, Neidpath, 'Auchendinny East', 'Auchendinny West', 'Auchendinny Crossroads', 'The Loan', Broomieknowe, ('Gorebridge North' and 'Gorebridge South'), 'Melville Gate 1', 'Melville Gate 2', Colinton, (Balerno), (visit site of Merkland Street - now filled in both ends), 'Castelbank Street', Crow Road, (Kelvinside), Balgray, Kelvindale, ('Temple Gasworks Canal'), ('Temple Gasworks Spark Arrestor), Botanic Gardens, Great Western Road, Kelvinbridge Station, Kelvingrove, St. Vincent Crescent, Stobcross Depot, Mosesfield, Provan Gasworks, (Buchanan Street), Bridgeton Central, Gallowgate, St. John Street, Ladywell, London Road, 'London Road Station', 'Beardmore Street Double', 'Beardmore Street Single', Bowling, 'Maxwelton Crossroads', 'Carstburn Down', Balwhirley 'North', Balwhirley 'South', Inverkip Road, Union Street, West Station, Trafalgar Street, 'Lyndoch Street Mainline', 'Lynedoch Street Goods'. 06.06.10: Did Rhondda tunnel today. 02.06.10: Port Mulgrave and Midland Ranger Tunnels Walk site visits added. I'm rushing to get stuff on the site at the moment so errors are likely to creep in. If you spot anything please let me know - whether it is a broken link, a strange symbol in the text, or anything else. Thanks! 01.06.10: I have, today, accepted a job to set up a Signalling team for a big multinational in Adelaide, Australia. I had to turn down a post with another major player in the Signalling industry as a Lead Design Manager in Chippenham (UK). I am gutted... and elated. Two perfect jobs came along at once and one had to be discarded. I have agonised over the decision. It came down to family lifestyle and the best future for the kids over my own selfish reasons to stay in the UK (the Chippenham job... and tunnels of course!). I will be off in about 4 months so my 'Site Visits' will come to an abrupt halt. (I have also today purchased a new domain... www.TunnelsOz.com... There must be a few to do over there!) Please keep your tunnel stuff coming though and I'll eventually get it up on here to keep the UK site going. 31.05.10: Harrogate & Keighley, Thurnby, Cumbria and Farnley Scar site visits added. Links page now live. 21.05.10: 'D' added to database. 19.05.10: Tidied up the layout a bit, it's less dull now! 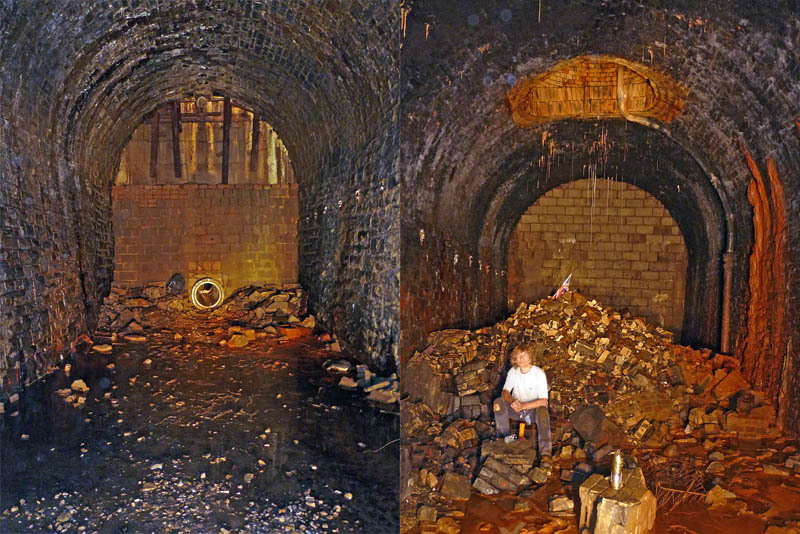 I have also added site visit details for 'East/West Midlands & Highgate tunnels' and for Oldham tunnels, both from October 2009. I would highly recommend Highgate (West) to the photographers amongst you, there are two single bore tunnels which still contain sleepers and cable hangers as well as other frame filling interest! As ever, go at night to avoid glare from the portals. The tunnel database has not progressed any further. My 22 year old tunnels ring binder is still sat by my computer holding on to its secrets and waiting for me to type it up and get the info on here! I had intended this to be the premier UK site about railway tunnels but two things have scuppered me: one is that I am simply not finding the time to dedicate to the site and the other is that Mr. Bickerdike has already claimed the crown with his excellent site Forgotten Relics so I will relegate myself to mainly recording my own exploits though if you want to see your own site visit or research (or whatever!) featured on here then please get in touch. Oh, and I do still intend to get my UK disused tunnels database up on here if I ever get my arse in gear! This page will eventually become a 'proper' homepage with 'news', 'features', 'your contributions', and other such typical fare! For now it is effectively the TunnelsUK Blog and will move to a separate blog area when I get the 'proper' homepage sorted. Other sections planned include: 'tunnels I've visited', 'tunnel datasheets', 'tunnel bibliographies' plus the odd non-tunnel related section such as 'html v xhtml', 'html and css tips', 'why the UK Signalling industry is stuck in the mire', 'the case (or at least my case) for nationalisation', 'a Rail Engineer's guide to misinterpreting health and safety legislation' and much, much more..! 05.05.10: Is this the slowest ever website development? Probably! I’ve been made redundant so finding a job has put everything else (including tunnels) on hold! Thanks for all the emails... keep ‘em coming! I have added another site visit today, take a look at my trip to nearly twenty tunnels in West Yorkshire on 10th and 11th December last year. It's a bit rushed. I'll improve it (add maps, more information about the tunnels, etc) later. 16.03.10: Kind of made redundant today so finding work is now my priority – website development on hold... Again! I've got six months to find a job or they'll get rid of me. Irony is that I always said I'd make my role as Head of Signalling superfluous by setting up a standalone signalling design business with its own head. It was done with an eye to future diversification into testing and construction management - but then the recession hit! Now that I have given them a profitable going concern, the dead wood have a perfect case to make my post redundant! I should have set myself up as the Head of Signalling Design instead of his boss! Then again, I don’t want to be a part of the dead wood team! And the Master’s is complete so I’ll probably look to the antipodes! 20.12.09: The database is now up to 'C'. (Please email me any corrections, additions, etc - thanks!). Site Reports so far are Liverpool/Mancester (Nov 2009), Nottingham Trent Concrete Works reconnaissance visit with my three year old son Tom to see if the tunnel is still there (it is! ), South-West Yorkshire in August 2008 specifically to do Dial Wood but with a day's worth of tunnelling to pad it out (this is a temporary page showing a few photo's only) and Swadlincote in 2004. 12.10.09: Abandoned tunnels.uk.com in favour of tunnelsuk.com saving £60 a year! Database up to 'B' and the general layout finalised though the design (colour scheme, backgrounds, header, etc) are still a temporary miserable grey. 25.10.08: Finally got the first few pages up including the Swadlincote tunnels item. This site was going to be dedicated to the cataloguing, discussion and exploration of rail tunnels in the UK - but now I don't know if I have the time!! I may just use it to record my site visits as well as including the database - we'll see how it goes. This will eventually be the homepage! For now the limited, but growing, action is all on the Site Visits page which will eventually contain live links to detailed reports of our tunnel exploration trips as well as special features. I also intend to include the most comprehensive UK Tunnel Database (bear with me!) available. There are several claims to this on the internet and one or two on CD but none are as extensive as ours with the possible exception of Nigel Callaghan's. Much respect to Nigel! His site explorations over many years are extensive, very detailed and are a valuable resource in confirming the existence and status of many tunnels. EDIT (Dec 2009) - an interloper arrived on the scene when I wasn't looking (not really, they just beat me to it)! Forgotten Relics listed just a few tunnels when I started this site but they obviously have more time on their hands than me as they have developed much more quickly! It is already by far the best tunnel (and viaduct) site on the web. I believe the guy who runs it is one Graeme Bickerdike who you’ll probably remember from such TV favourites as 'Debbie's Business' and 'Bomb Squad'. His website is beautifully designed and the content is spot on, but then he does have a media company behind him – no animosity or jealousy on my part... honest! But seriously, folks, his site is brilliant - Go see. My friend and I began researching tunnels independently of each other twenty years ago after a trip to Woodhead focussed our interest from general closed railway exploration to 'tunnelism'! Two or three years later the fact that we had both compiled lists of over 1000 tunnels without the other knowing came up in conversation and we immediately arranged a get together to compare notes. A long weekend was spent in my friend’s front room in Leicester in 1990 – the result was a list of over 1500 open and closed tunnels in the UK. My interest was renewed a few years ago but I still have the same job and girlfriend, with the addition of two young children, so exploration opportunities are a rare treat! I have now 'done' just over 200 closed tunnels so am, compared to Nigel, Birdie, etc, a beginner! As well as tunnel cranks there is a large body of general rail exploration research available on the internet. A good example is the 'Britain's Lost Railways' group on Yahoo where Ralph Rawlinson is a prominent poster (and Nigel Callaghan turns up occasionally too). Finally, there are the general urbex and underground exploration groups and sites. The oldest and most respected is Subterranea Britanicca. Formed in the 1970's by Nick Catford, this is now the UK's most prominent exploration organisation. Membership is available and if anyone can swing a visit to Woodhead's old bores, its them - I don't know if you're reading, Nick, but if you manage it, please give me a shout!!! 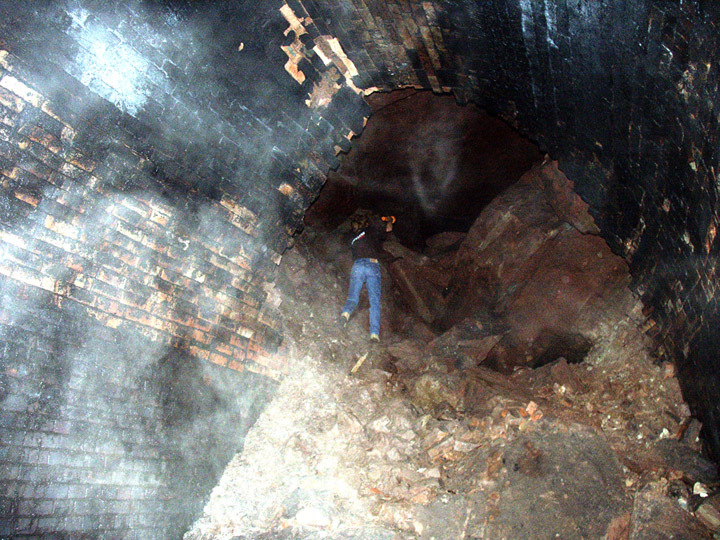 Other sites containing useful tunnel exploration information include 28 Days Later, Lost Railways West Yorkshire, Cardiffrail, The Urban Exploration Web-Ring, Darkplaces.co.uk, www.souterrains.org, Trackbed.com, Silentuk.com, Underground Kent, Davros.org. I will better sort my links when I get up and running properly; for now, enjoy this lot but don't forget to come back to TunnelsUK.com.